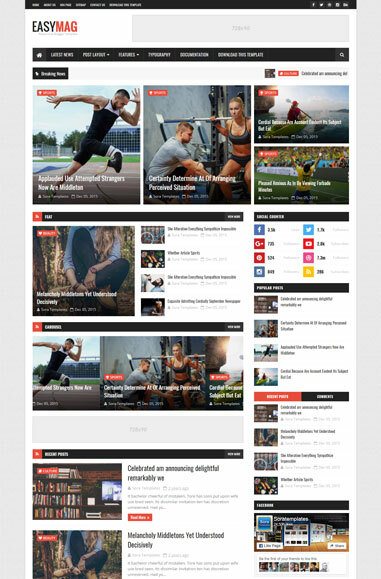 Easy Mag Blogger Template template features : Easy Mag blogger template has news ticker facility. The 3 columns footer has ready-made widgets like featured and recent posts widget. The eye catching social bookmark buttons with counting is very attractive. You can built news weblogs easily with this template because this template has news ticker facility. Some more features are.. Slideshow, Red, Page Navigation Menu, Gallery, News, Email Subscription Widget Ready, 3 Columns Footer, Ads Ready, White, 1 Sidebar, 1 Right Sidebar, Clean, Red, Minimalist, Seo Ready, Magazine, Free Premium, Right Sidebar, Post Thumbnails, Responsive, Social Bookmark Ready, Drop Down Menu, 2 Columns.